The landscape always makes us amazed by its beauty. Sometimes beautiful landscapes are created from extraordinary natural disasters. Like volcanoes, beaches and caldera are beautiful landscapes that are very popular. They are created from disasters that are sometimes very powerful. And Russia always has interesting landscapes to discuss. And even makes us want to immediately visit one by one. And one of the amazing landscapes in Russia is the Uzon Caldera in Kamchatka, Russia. The Kamchatka Peninsula is located in the northeastern part of Russia. The peninsula has a total area of ​​270,000 square kilometers with 3 wildlife sanctuaries, 5 national parks, 8 federal, and 23 local nature reserves, 105 natural monuments, 2 zones of resort-sanatoriums, and many other protected areas. Kamchatka’s main attraction is the volcano. In fact, images of volcanoes are depicted on the flags and emblems of both the Kamchatka Krai and Petropavlovsk-Kamchatskiy, the main cities in the region. In total there are more than 300 Kamchatka volcanoes, but only 30 of them are active. Since 1996, the Kamchatka volcano and adjacent areas have been listed as UNESCO World Heritage Sites. this area is known for its beautiful scenery and various kinds of biological species. Uzon Volcanic Caldera in the Kronotskiy Wildlife Refuge offers one of the most amazing sights you see. And here are 7 interesting facts about Caldera Uzon in Kamchatka, Russia. The Uzon Caldera is filled with the waters of Dalnee Lake (Far). The western part of the caldera is flooded. There are several lakes in that section, the biggest of which is Lake Middle, which collects water from all the caldera. In the west and north of the caldera surrounded by ridges the remains of ancient volcanoes. Uzon Caldera is the strongest hydrothermal system in Kamchatka. The narrow zone of 200-350 meters is divided into 5 thermal fields and includes thousands of hot springs with lots of steam flow, volcanoes, mud, ponds, and thermal lakes. When you see this caldera directly, you will feel the sensation of extraordinary natural wonders. The natural beauty of the Uzon Caldera is still very original, and has never been changed by humans at all. Nothing is made in this place. Uzon Caldera is dubbed as jungle and volcanology. The Uzon volcano is located in the Kronotsky Nature Reserve, south of the lake of the same name. This district is home to the youngest oil in the world produced. In the highlands around the volcano, there are hundreds of steam pools that occur due to chemical explosions, which are between green bushes and brownish tundra. The western part has 600 water springs. The flora and fauna are very diverse and colorful. A number of living algae and bacteria attract special attention to scientists. 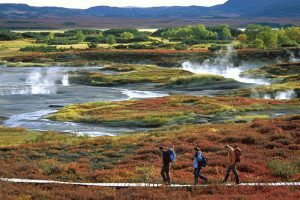 If you are interested in visiting water springs, hot water vapor, lakes, or seeing the tanned tundra on the Uzon Caldera, then you can use a helicopter or walk. You can fly from the nearest airport, Yelizovo, which takes around one and a half hours. Or for those of you who visit the geyser valley with a helicopter that costs 37,000 rubles, you will stop enjoying the warmth of Caldera Uzon. For tourists who love the purity of Russian nature, the Uzon Caldera must be one of the lists of places they will visit. Because this place is truly natural. You will feel the pleasure of truly pure natural beauty. Tourists who come to this place are from local and foreign residents. They see the development of extraordinary hydrothermal activity. Hot pools, boiling mud pools, hot mud wells and volcanoes. Besides, that all of these things are found side by side with luxurious vegetation and very stunning color seaweed. In 2008, after a long sleep, the geysers began to erupt in Uzon, increasing its appeal to visitors. This place really gives uniqueness that you have never seen before. This place really warms the tourists. The weather in Russia is very cold, you can avoid it by getting warmth in this place. When you see this place directly, the combination of panoramas will make you feel alive in a fairyland. Lake Bannoye or the sauna lake is very famous from this place. This lake contains sulfur cork which is located 28 meters at the bottom of the lake and implements a reservoir of liquid sulfur underneath. Even today, arsenic, antimony and mercury sulfide ore continue to form and even oils with different characteristics have been observed to seep to the surface. The Uzon caldera can be a microbiogeochemical protection for the conservation and natural reproduction of microbial genetic resources for science in the 21st century. The Uzon caldera is beautiful at all times of the year and in any weather, but the bright colors in September are more fascinating, they evoke true admiration for everyone who sees them. So, for those of you who still want to explore the natural beauty of Russia, the Uzon Caldera must be included in the list of tourist attractions that you will visit. Because the Caldera Uzon will give you warmth and charm that you have never felt before. That’s 7 Interesting facts about the Uzon in Kamchatka Caldera, Russia that we present to you Russian nature lovers. And these interesting facts will surely make you amazed by Russia’s charm and want to visit it immediately when the holiday comes.